Gender markings on lavatories are a huge talking point, so it is no surprise an apparently old 'gay' sign for the toilets at an Italian B&B has caused controversy. 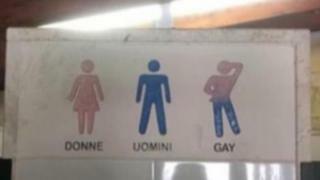 Le Camporelle di Cavallino, a farmhouse in Lecce, southern Italy, has been criticised for signage which separates users into male, female and gay. LGBT groups have accused the B&B - which has agreed to take down the sign - of confusing sexual orientation and gender identity. Gianluca Rollo, who shared a post from an LGBT organisation, Liberamente e Apertamente, to highlight the signage, told local newspaper, Nuovo Quotidiano di Puglia, the sign was demeaning and misleading. The owners, however, blame the previous management for making the sign, which is thought to have been installed 15 years ago. "We have often hosted homosexual couples with whom we have established beautiful relationships to the point that some have become family friends." They are also disappointed that their B&B is getting such bad publicity, especially as somebody uncovered and photographed a sign which wasn't even theirs.